No one in the retinal disease research community brought more passion and commitment to his or her work than Dr. Eliot Berson. As The William F. Chatlos Professor of Ophthalmology at Harvard Medical School, he dedicated himself to clinical care and vision-saving research for people with inherited retinal diseases for five decades. In addition to being a world-renowned clinical researcher and developer of vitamin A therapy for retinitis pigmentosa, he was beloved by his patients and their families for his hopeful and encouraging attitude toward their challenging, vision-robbing conditions. Dr. Berson passed away on March 19, 2017, at the age of 79. He is survived by his wife, Kyra, of 35 years, and brother, Dr. Frank Berson. "Dr. Berson was truly a pioneer. He dedicated himself to inherited retinal diseases when little was known about them, and virtually no other doctors or scientists were focused on research to increase knowledge of these devastating conditions," says Stephen Rose, PhD, chief research officer, Foundation Fighting Blindness. "He was also always respected for his honesty and openness with patients. He was a genuine personality." The Foundation Fighting Blindness — the world's leading, private, retinal-research nonprofit — was established in 1971 thanks to Dr. Berson's introduction of Lulie and Gordon Gund to Ben and Beverly Berman. Mr. Gund had lost his vision to RP. The Bermans' two young daughters, Mindy and Joanne, also had the condition. Shortly after they met, the Gunds and Bermans co-founded the Foundation to drive research for treatments and cures. Since its inception, the Foundation has raised more than $700 million toward its mission of eradicating the entire spectrum of inherited retinal diseases. The Foundation's first investment created the Berman-Gund Lab for the Study of Retinal Degenerations, directed by Dr. Berson, at the Massachusetts Eye and Ear Infirmary. The lab continues today as a thriving research center. 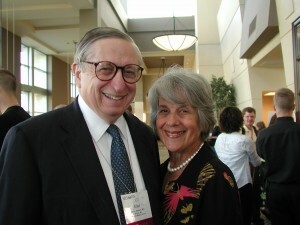 "Lulie and I met Eliot in the summer of 1970 when he had been referred to us as one of the few clinicians interested in doing research for inherited retinal diseases. After he diagnosed me, I asked him about my prognosis based on my ERG, and he, in his own wonderful way, was very candid with me, that my vision wouldn't last long," says Gordon Gund, co-founder and chairman emeritus of the Foundation. "In the spring of 1971, I called Eliot to follow up on his research lab proposal to the board of the Massachusetts Eye and Ear Infirmary. He sent me a copy, and a few days later called me to arrange a meeting with Ben Berman. The rest is history." "My family and I are grateful for having known Dr. Berson and for considering him as family. He provided us with hope for a cure or treatment for retinitis pigmentosa when there was none," says Mindy Berman Caplan. "His lifetime commitment to research, his dedication to the Foundation, and his compassion for all his patients is his legacy." In 1993, Dr. Berson reported on a groundbreaking vitamin A treatment for retinitis pigmentosa (RP), a leading cause of inherited blindness, in the journal Ophthalmology. Ultimately, his investigations showed that a therapeutic regimen of vitamin A palmitate, docosahexaenoic acid (DHA), and lutein preserved vision in people with certain forms of RP. He published more than a dozen papers on the nutritional regimen. Dr. Berson was also renowned for evaluating, tracking, and predicting the course of vision loss in patients using an electroretinogram or ERG to measure the retina's sensitivity to light. Having conducted and analyzed thousands of ERGs, he was better able to predict the rate of visual decline in his patients. A graduate of Phillips Andover, Yale, and Harvard Medical School, Dr. Berson authored more than 250 peer-reviewed papers. He has been recognized with awards from the International Society for Genetic Eye Diseases, the Association for Research in Vision and Ophthalmology, the National Eye Institute, Lighthouse International, Alcon, and the International Society of Eye Research. In 1999, he received the Llura Liggett Gund Award, the Foundation's top research award, recognizing career achievement.